The World Cup group stage has come to a close and two players have stood out from the rest in what is proving to be a fantastic tournament. Leo Messi and Neymar Jr. The Barça duo are top of the goalscoring charts with four goals each in the first three matches, a tally only Germany’s Thomas Múller has been able to match. Messi is also the only player who was named FIFA Man of the Match in every game. Neymar won the award twice, for the two games won by Brazil in their group. Their respective managers, Sabella and Scolari, will be hoping for more of the same in the knockout stage, which gets under way on Saturday. After a surprisingly low-key showing at South Africa 2010, Leo Messi has been firing on all cylinders in Brazil. His four goals take him to 24 goals in his last 24 appearances for Argentina, and he’s also supplied five assists. In 2014, he has scored 32 goals and given 10 assists in 36 games for club and country. 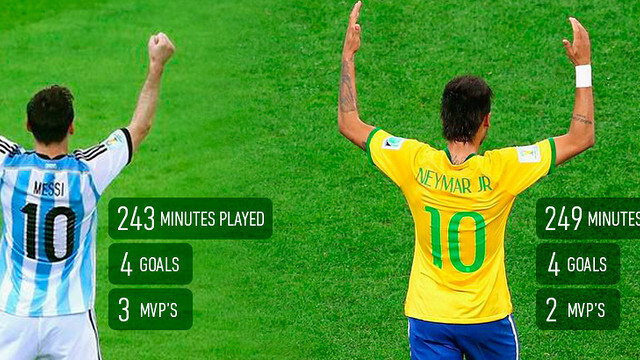 Neymar, meanwhile, is the target man in the host nation’s squad, and is delivering the results that Scolari needs. In 52 appearances for the ‘canarinha’, Neymar has now amassed 35 goals and 20 assists.